Due to the Yu-Gi-Oh National is taking place in Chicago this weekend, there will be NO Yu-Gi-Oh and Vanguard Tournaments this Saturday, 7/13/13, at Galaxy in Naperville. For those who are not going to the National, we continue to offer sizzling summer sale of packs, decks, playmats, deck boxes, sleeves, ... 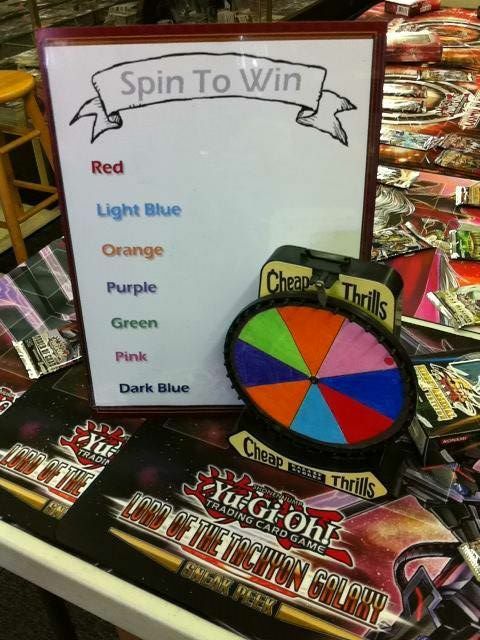 It is time to Spin-and-Win FREE stuffs!! The Specials ends when we run out of goodies!! Come early and often!! You don't want to miss out! !